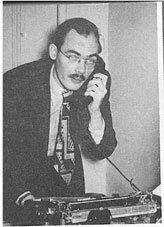 Frederik Pohl Born Frederik George Pohl Jr. in Brooklyn, New York, on November 26, 1919, the only child of Frederick George Pohl, a salesman, and Anna Jane Mason Pohl, a secretary. Attended Brooklyn Technical and Thomas Jefferson High Schools, dropping out at 17. In 1934, at 14, joined the Brooklyn chapter of the Science Fiction League, a fan group, editing and writing for club magazine The Brooklyn Reporter. Beginning in 1936 was active in the Young Communist League, co-organizing a Committee for the Political Advancement of Science Fiction, but grew disillusioned after the 1939 Hitler–Stalin Pact. In 1937, with John Michel, Donald Wollheim, and Robert Lowndes, co-founded the Futurians, another science-fiction fan group whose members included Isaac Asimov and Cyril Kornbluth. Worked as a freelance literary agent, and in 1939 was hired as editor for pulp magazines Astonishing Stories and Super Science Stories. Also published short stories, often under pseudonyms and with various collaborators including C. M. Kornbluth, Dirk Wylie, Henry Dockweiler, and Robert Lowndes. Married fellow Futurian Doris Baumgardt in 1940. Joined the Army in 1943, serving with the 12th Weather Squadron in Italy and editing the squadron newspaper. Divorced Baumgardt in 1944 and married Dorothy LesTina. After the war worked in New York as an advertising copywriter and book editor for Popular Science Publishing; began a literary agency. With Lester del Ray, founded the Hydra Club for science-fiction writers. Divorced, and married writer Judith Merril in 1948; they had a daughter. With Cyril Kornbluth, wrote Gravy Planet (1952), published in book form as The Space Merchants (1953). 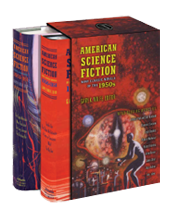 Edited Star Science Fiction Stories anthologies for Ballantine Books (1953–59), and other anthologies. Married Carol Stanton in 1953; they had three children. Assisted Horace Gold in editing Galaxy magazine. Published novels Search the Sky (1954, with Kornbluth), Gladiator-At-Law (1955, with Kornbluth), Preferred Risk (1955, with del Rey), Slave Ship (1957), Wolfbane (1959, with Kornbluth), Drunkard’s Walk (1960), A Plague of Pythons (1965), and The Age of the Pussyfoot (1969), as well as stories, juvenile novels, and non-science fiction novels. In 1960, took over editorship of Galaxy and If, serving until 1969; began magazines Worlds of Tomorrow (1963–70), International Science Fiction (1967–68), and Worlds of Fantasy (1970), and traveled widely as a lecturer. Expanded audience with novels Man Plus (1976); the “Heechee” sequence (beginning with Gateway in 1977, winner of the Hugo and Nebula awards, and continuing through five more volumes); JEM: The Making of a Utopia (1979); and The Years of the City (1984). Married Elizabeth Ann Hull in 1984. Published non-science fiction novels including Terror (1986) and Chernobyl (1987). Later science fiction included Black Star Rising (1985), The Coming of the Quantum Cats (1986), Narabedla Ltd. (1988), Homegoing (1989), The World at the End of Time (1990), and the “Eschaton” series: The Other End of Time (1996), The Siege of Eternity (1997), The Far Shore of Time (1999), and All the Lives He Led (2011). Completed Arthur C. Clarke’s unfinished novel The Last Theorem (2008). Served as president of the Science Fiction Writers of America (1974–76) and World SF (1980–82), and was inducted into the Science Fiction Hall of Fame in 1998. His autobiography The Way the Future Was (1978) was continued and expanded online beginning in 2009 in “The Way the Future Blogs.” Lives in Palatine, Illinois. C. M. Kornbluth Born Cyril Kornbluth on July 2, 1923, in New York City, the second child of Samuel Kornbluth, an accountant, and Deborah Ungar Kornbluth, the daughter of a tailor. (Later added the initial M. to some of his bylines, after his wife Mary.) Grew up in upper Manhattan, graduating from George Washington High School in 1940. While still in high school, attended Futurian Society fan meetings in New York, meeting Isaac Asimov, Frederik Pohl, Donald A. Wollheim, and others, and contributing poems and stories to Futurian-edited magazines. 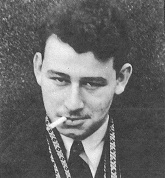 Began earning money for his stories, often writing collaboratively (with Robert Lowndes, Pohl, Wollheim, Dirk Wylie, and others) and publishing under pseudonyms, including S. D. Gottesman and Cecil Corwin. Enrolled at City College, but after a few months dropped out to write professionally. In 194243, apprenticed as a machinist under the National Youth Administration, worked in a Connecticut machine shop, and enrolled in a military training program; married Mary Byers, with whom he would later have two children. Called to active duty in the Infantry, he fought in the Battle of the Bulge, earning a Bronze Star; developed combat-related health problems, including chronic tinnitus and hypertension, that would persist until his death. After his Army discharge, moved briefly to a farm near Springfield, Ohio; wrote detective stories for 10 Story Detective, Black Mask, and Dime Detective. Relocated to Chicago, enrolling at Wilson Junior College and then the University of Chicago, without earning a degree. Worked as a news writer for Trans radio Press Service. Urged by Pohl, took up science fiction again, publishing The Little Black Bag (1950, later adapted for television three times), The Silly Season (1950), and The Marching Morons (1951). With Judith Merril, collaborated on Outpost Mars and Gunner Cade; finished solo novel Takeoff (all 1952). Returned to the New York area, ultimately settling in the small town of Waverly. With Pohl, collaborated on Gravy Planet (1952; later retitled The Space Merchants, 1953), Search the Sky (1954), Gladiator-At-Law (1955), and Wolfbane (1959), as well as the non–science fiction novels A Town Is Drowning (1955), Presidential Year (1956), Sorority House (1956), and The Man of Cold Rages (1958), some under the pseudonym Jordan Park. Writing independently, he published The Syndic (1953) and Not This August (1955); story collections The Explorers (1954) and A Mile Beyond the Moon (1958); and non–science fiction novels The Naked Storm (1952, as Simon Eisner), Valerie, and Half (both 1953, also as Jordan Park). At the end of 1954, accepted position as assistant curator for Tioga Point Historical Society Museum, in nearby Athens, Pennsylvania; began Civil War novel The Crater (never published) using museum documents and records. Attended 1956 Newyorcon (14th World Science Fiction Convention) and the Milford Science Fiction Writers Conference. At the latter, joined in an oracular all-night encounter with Algis Budrys, James Blish, Damon Knight, and Jane Roberts; profoundly moved, they later referred to each other as The Five and began a round-robin exchange of letters exploring their interconnectedness. Gave 1957 lecture on The Failure of the Science Fiction Novel as Social Criticism at the University of Chicago. Moved with family to Levittown, New York. Prepared to assume consulting editor role at The Magazine of Fantasy and Science Fiction, but died of a heart attack on March 21, 1958, in Levittown. Works collected posthumously in The Wonder Effect (1962) and His Share of Glory: The Complete Short Science Fiction of C. M. Kornbluth (1997), among other volumes. Frederik Pohl and C. M. Kornbluth met as teenage members of the Futurian Society, a New York fan group, and their intensely productive friendship was cut short only by Kornbluth's premature death, of a heart attack, at 34. Here, in an April 20, 2009 post from his lauded blog ("The Way the Future Blogs"), Pohl remembers his coauthor.